Jun 25, 2015 - Crown Street Car Park is the cheap alternative to expensive car parking in Leeds the city centre. 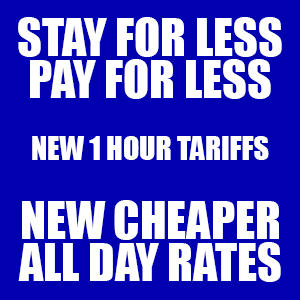 Click Here for Tariffs & More Details. You can now pay for your parking at this site using Parkonomy, please follow the book now link below to access this facility. There is no need to print off any documentation or display anything as this is a ticket-less option designed to make your parking experience that much easier. Just simply fill in your details online and make your payment. You do not need any further tickets or documentation just turn up and park! Crown Street Car park is open 24/7 and monitored by CCTV 24 hours a day. We are located just behind the Corn Exchange in Leeds city centre. This puts us right in the heart of the action in easy walking distance to all of the shopping, culture and nightlife attractions. Nestled behind the iconic Corn Exchange, Crown Street Car Park is the best located car park in Leeds City Centre, being literally a few minutes’ walk from all of Leeds major shopping attractions and Leeds’ renowned nightlife. The Victoria Quarter, the Trinity Shopping Centre and Leeds Markets are just around the corner as are bars such as Brew Dog, Normans, Revolution, Call Lane Social and Neon Cactus, restaurants such as Pizza Hut, Reds True Barbeque, Pie Minister and Five Guys and other favourites such as Pure Gym and Chilli White. Whatever you want from Leeds City Centre, Crown Street is the place to start. Just popping into town? Being located just off the Leeds Loop, arriving at Crown Street Car Park couldn’t be easier. Access from both North and South of the city is taken from The Calls, turning right along Crown Street, immediately behind the Corn Exchange, before reaching either the Call Lane or the Lower Briggate junctions. Look out for the ‘P’ sign just before Latitude Wine Merchants in the Arches. Crown Street is a Pay and Display parking facility and the machines accept both coins and credit or debit cards. CLICK HERE to buy your ticket on Parkonomy.